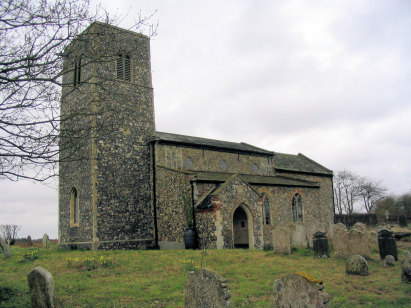 The parish of Rackheath lies in eastern Norfolk about 5 miles northeast of the city of Norwich. Its name is derived from the extensive reach of Mousehold Heath, now confined within the city's ring road but formerly stretching out for some miles into the area. Rackheath, prior to the 20th century, was a small estate village, little more than a hamlet; its proximity to the city and access via the A1151 has led to extensive growth as a commuter village and modern housing estates and industrial units now dot the former heathland. Prior to this growth Rackheath would have been dominated by its Hall and lived a mainly agricultural existence. The opening of Norwich's northern bypass through parts of the parish will only serve to add to Rackheath's growth and there is a likelihood that it will become contiguous with the growing city in the not too distant future. All Saints' church sits in splendid isolation more than a half mile northeast of the A1151 and accessed by a long and narrow dead-end lane. Pevsner dates the church to the early 14th century and with the exception of the southern porch, a 15th century addition, only the 1840s restoration has added to or refreshed that origin. 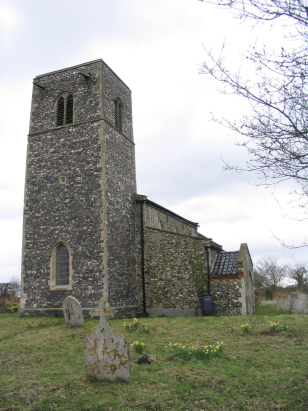 The unbuttressed western tower is rather stark in its use of the local flint and the building is generally rather plain with little exterior decoration. The church is accessed along Swash Lane which turns off just southwest of the Green Man and heads across Sloe Lane into the church's access road, finally ending at the church in a turning bay. The church is shielded by tall hawthorn hedges but through the gate the open churchyard, surrounded by large arable fields has few obstructions to photography. A single standard 800-entry register book covers not only the period of this transcript but runs onwards to finish in 1897. This register is filmed on Microfilm MF1422 in the collection of Norfolk Record Office which was used to prepare this transcript. This film is one of the more modern in the collection and benefits from the crisp and sharp imagery of today's techniques making for a straightforward piece to prepare.